Road Warriors at the finish line. 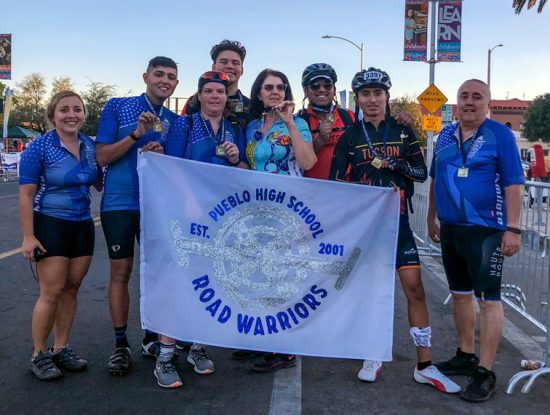 For the 17th year, Pueblo’s Road Warriors participated in the world-renowned El Tour de Tucson, which was held on Saturday, Nov. 17; three students and three faculty members were among the more than 9,000 riders. Seniors Andrew Romero and Jose Antonio Pesellin and junior Leo Parra, along with faculty members Mr. Ernesto Somoza (sponsor), Ms.Marie Little and Ms. Tina Bruce, all made it to their finish lines. In the past, Somoza has bicycled from Oceanside, CA to San Diego, about 50 miles. He’s also cycled from the U.S.-Mexico border to Ensenada, Baja California. 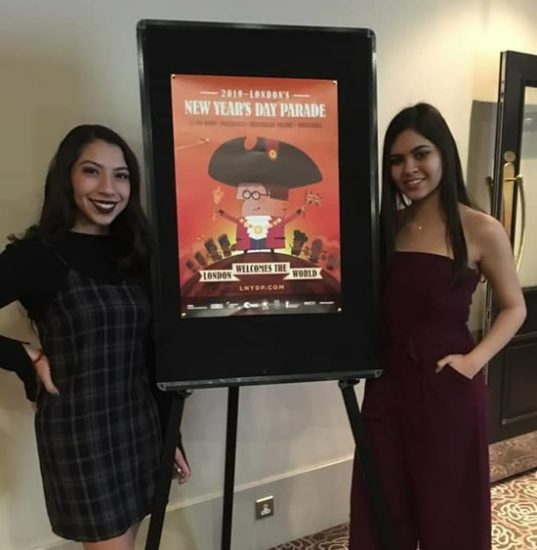 Two Pueblo students, Pesellin and Parra, finished the 100-mile race, as did teacher Somoza and his sister, Melissa; Somoza’s father, ­­­­­Xavier Somoza, also participated. Parra said, “The race was tiring. 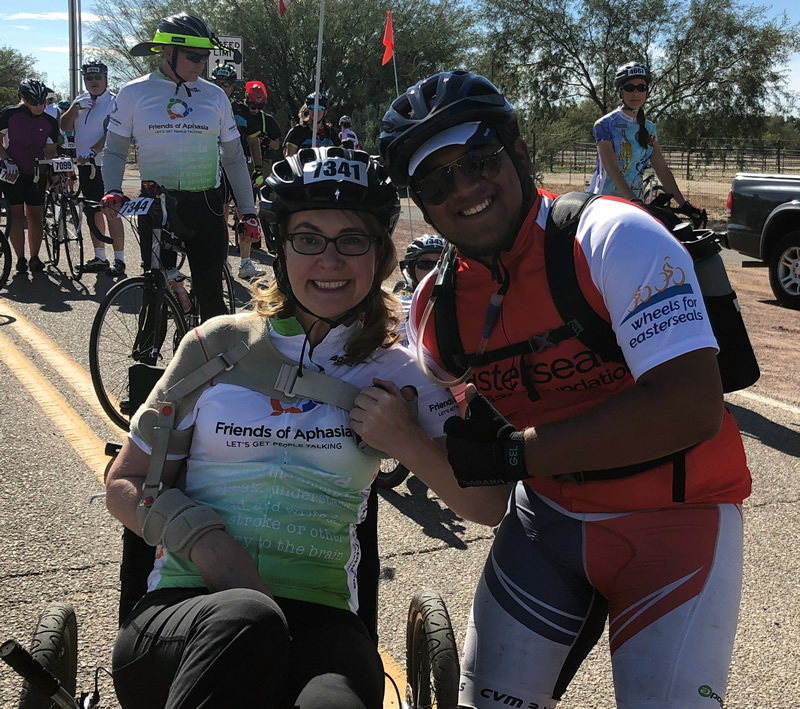 It was tough, but it was really important to me to reach the finish line.” He added that he raced on his Scatante bike and completed the race in eight hours. Parra plans to beat his time next year as a returning member of Road Warriors. Teacher Somoza completed the full 100-mile course—mostly to ensure that students would be safe and that they would finish the complete race. Somoza has participated in many races in the past several years, including 50-miles rides in California. Another teacher, yearbook and exceptional education teacher Little, participated in the event for the first time, finishing her 25-mile course. Andrew Romero with Gabrielle Giffords. El Tour de Tucson began in 1983 with just a few dozen riders. In the past several years, as many as 10,000 riders have participated in this event, held each year on the third Saturday in November. This year, a record number of riders dominated the streets of Tucson (an estimated 11,000) in different distance races. Sponsor Ernesto Somoza also adamantly encourages students to join the Road Warriors Club if they are looking for something to do after school that’s a little bit different than just joining a sports team. “Road Warrior members have the opportunity to meet other bicyclists in the community. Tucson is truly a bicycle-loving and bicycle-friendly city,” Somoza said. He added that earlier this month, the club had a new member drive that added nine new cyclists who did not participate earlier this semester. These students will continue to participate in monthly rides until the end of the school year. Rides, which will last about five miles, will beheld on the first Thursday of each month from 3:45 until 5:30 p.m. No prior experience is required, Somoza said. Tardy line in front of administration building. Tardiness has historically been a big problem in our school, but we are improving on this situation despite long tardy lines. During the first week in December, there were 1,014 tardies reported in the attendance office. The next week, the number of tardies plummeted to 769 tardies, and more than 90% of these tardies were during the first period. Pueblo’s faculty has addressed this problem and working hard to help decrease students’ tardies. As of mid-December, Behavior Interventionists have completed 258 interventions, 236 student conferences, 20 parent conferences, and two lunch restorations. Mr. Steve Lopez, assistance principal, affirmed that after students are tardy six times, parents will be called. If tardies persist, Lopez added that home they will be required to attend “Saturday School”. Tardiness begins in the morning right after the first bell, at 8 a.m. 1st Period, and within 15 minutes, the tardy line serpentines from the attendance office to the outside—consisting sometimes as many as a hundred students. Some students express their frustration because they were just seconds late—and still not allowed in class. By the time they receive their tardy slip and go to class, students will have missed half—or more—of their class. Pueblo teachers stop by to judge the yummy desserts. 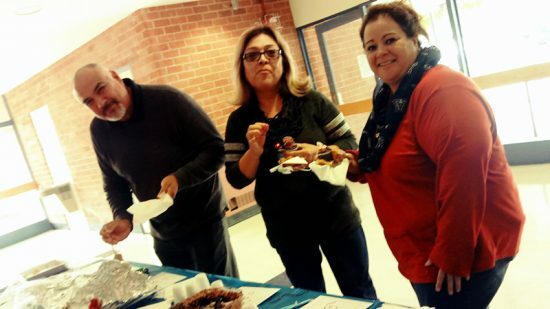 Just in time for the holidays, Ms. Sarah Barnes has continued the trend of sponsoring a taste-testing contest for Pueblo’s faculty and staff. The name of this timely event, “Desserts in the Desert”, truly lived up to its name—with a dozen or so contestants vying for a first place win for their home-made tasty treats, ranging from toffee bars to cupcakes to “specialized” cakes and other confectionery concoctions. On Wednesday, December 5, during both lunches, several dozen members of the Pueblo community participated in judging their favorite two desserts. The top three winners were announced later in the day at teachers’ professional development meeting at 2:30 p.m. The first place winner was psychology and math teacher Ms. Hannah Yoder; she won for her scrumptious “chocolate toffee croissant rolls”. The one dollar entry fee from tasters added up to $48. Yoder received a $20 gift card, and she plans to use the money for “date night”. She added that she would like to host at least one more of these tasty events next semester and encourages the faculty to help her come up with new ideas and themes. 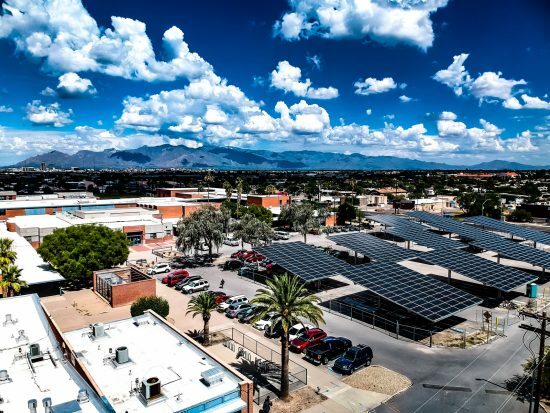 Even though the solar panels project in the parking lot was supposed to be completed before the beginning of this school year, this construction project did not begin until July 16, making the beginning of the school year a bit chaotic for many employees and students looking for parking spaces. More than three months later, the project is nearing completion. Final work continues,and an expected date of completion is estimated to be near the end of the semester. Completion of this project will ease parking nightmares for faculty, staff and students. Due to a reduced number of spaces in our usual parking lot due to the installation of the panels, many teachers have had to park in the several new areas that have been designated temporary parking locations. In the end, the solar panels will be improving the environment as well as reducing the district’s electricity bill. 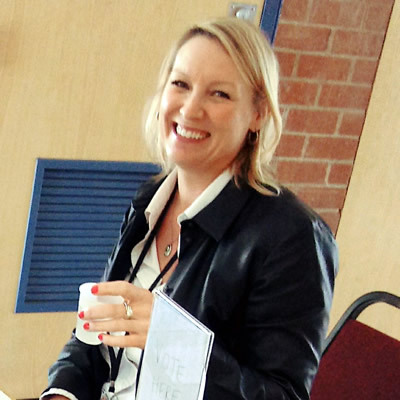 “Cutting the energy bill in half is always a good thing,” said Ms. Kathryn Gunnels, assistant principal. The big plan is to go green will take over the district. Many schools in T.U.S.D. have already completed their own solar panels projects in those schools’ parking lots.